Office Space in Boston’s Back Bay area. 0	Is this the end for Boston’s Famed Citgo sign? Boston’s iconic Citgo sign might go dark after the building is sold. As several prominent development companies angle to buy the nine-building package [Boston University is selling in Kenmore Square], they are weighing a delicate question: how to redevelop them — as any new owner would be likely to do — without blocking or moving the sign so it is no longer so visible from so many places around the city. Moving the sign and replacing 660 Beacon with a taller building wouldn’t be difficult, said Arthur Krim, a faculty member at Boston Architectural College and the sign’s unofficial historian. But move it much, and the views would be altered forever. According to CoStar there are 20 Class A properties that can offer 50,000 square feet or more of contiguous office space in the Seaport, Back Bay or the Financial District (see full chart below). 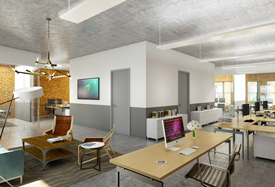 Despite Boston’s development boom, big chunks of office space are scarce right now. As of Oct. 1, there were 17 tenants looking for 50,000 square feet or more of top-end office space in downtown Boston, according to real estate firm JLL, and just 11 blocks big enough to house them. That means buildings with room are drawing interest. 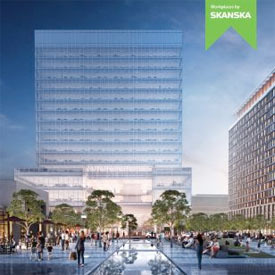 Three would-be tenants have proposed leasing all 180,000 square feet that Boston Properties has at 120 St. James, in the base of the old John Hancock Tower, president Douglas Linde told analysts recently. 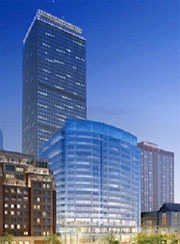 The space PWC left behind for the Seaport, at 125 High Street, also went quick. And Goodwin Procter’s soon-to-be-former home at 53 State has seen strong interest. 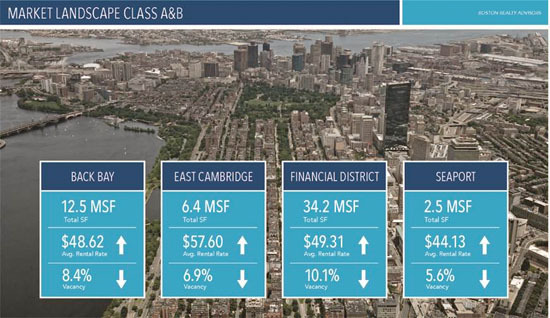 The Boston commercial real estate market continues northward with no signs of letting up. 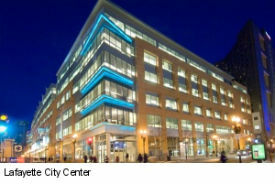 222 Berkeley Street and 500 Boylston Street are set move in a record trade at over $1,150 per square foot. The buildings total about 1.3 million square feet in size. A sale for $1.5 billion would put the price at nearly $1,150 per square foot, far higher than the selling prices of other commercial properties in Boston’s key business districts, which rarely top $700 per square foot…The Back Bay buildings are owned by a Blackstone subsidiary, Equity Office Properties, and share an underground parking garage. They are near the Public Garden, the Orange Line and commuter rail trains at Back Bay Station, and dozens of high-end retail shops. Not only does the Boston Marathon run down Boylston Street, but now that is followed by every tech consumer. 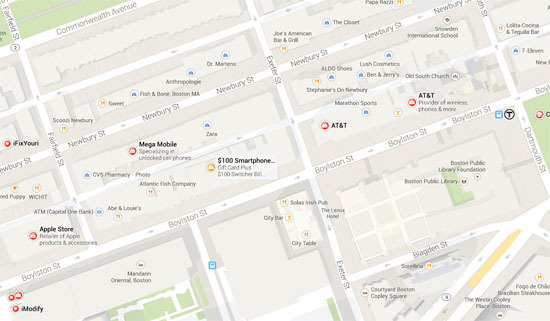 Boylston Street is home to the newly opened Verizon mega store at 745 Boylston Street. The next block over at 699 Boylston Street is home to the AT&T mega store. 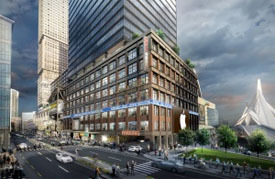 AT&T and Verizon followed the leader, Apple which opened at 815 Boylston Street and Microsoft which is in the Prudential complex at 800 Boylston Street. Need a gadget or some tech support? It can all be had on Boylston between 699 & 800 Boylston Street. The BBJ summarizes the recent additions, noting “Verizon [is] opening up a superstore on Boylston Street in Boston’s Back Bay later this month. 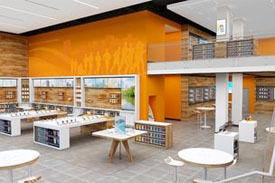 Now today, it’s AT&T that says it’s going to open a 9,000-square-foot store at 699 Boylston, not too far away from the Verizon superstore, which is at 745 Boylston…Both stores show how much Apple has changed the retail experience” in the Back Bay. 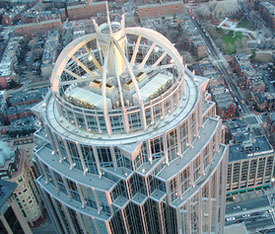 You can read more on the Boston Business Journal. Boston Rents continue its upward push with four office markets leading that charge: Back Bay, East Cambridge, Financial District and Seaport. 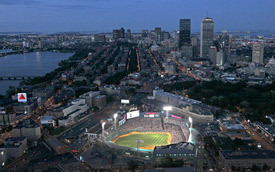 The Class A market within Back Bay is clearly leading the way, while some value still exists within the Class B market. A real driver in the increased rents is the cost of tenant improvement dollars going from shell space to fix up space. Not uncommon to see those numbers north of $75 per square foot. You can read the full article on the Boston Business Journal. Boston Properties is moving forward with 2 major projects located at 2 transportation hubs. Back Bay Station is the proposed spot of a new tower development, while North Station will benefit from the same. The real estate investment trust said this morning it has entered a joint venture to acquire the air rights for the 377,000-square-foot initial phase of the North Station redevelopment. It also has signed a 44-year extension on its lease for the Clarendon Street parking garage with the state Department of Transportation, part of a larger proposal to build two towers containing offices, residences and retail above Back Bay Station. As part of the agreement, Boston Properties will take over management of the renovated station, which serves the Orange Line subway and several commuter rail lines. Retail is getting a makeover in Back Bay. Boston Properties will making some major announcements as it pertains to their new building 888 Boylston Street and the neighboring retail spaces. The Shops at the Prudential Center are about to get a major overhaul complements of Boston Properties…Executives there declined to name any of the incoming tenants just yet, but vowed to identify the retailer that has been secured for a nearly 9,000-square-foot space in the mall in the next few months. 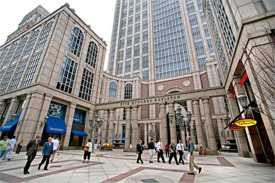 The Pru’s food atrium is [also] said to be getting a serious makeover and Boston Properties reportedly will build a grand-scale new building for office space, luxury condos and retail nearby at 888 Boylston Street near Gucci’s current location. As reported, the first Primark store will bow in Boston later this year at Downtown Crossing as part of the multi-million dollar Millenium Tower and Burnham Building development project. Millenium Partners plans to build a 60-story glass tower near where the original Filene’s once stood. Downtown Boston is the largest concentration North of New York City and is in the midst of strong rent growth across the Class A and B segments. Today’s technology and creative services companies are looking for easy access to public transportation combined with an open floor plan. For the third straight year in 2014, the Greater Boston office market recorded more than 2 million square feet of positive absorption, in a steady expansion that boosted occupancy rates at properties ranging from suburban office parks to converted warehouses and downtown high-rises.